Since leaving Montreal at the end of August, I’ve thought back many times to that day I walked through the old city and down to the port. There, in the Fleuve Saint-Laurent, which flows down to the Great Lakes, lies the small Île Sainte-Hélène. And on the other side of this island, half-concealed by a line of trees, is a structure that looks like it came from another planet. Two hundred feet high, and webbed with steel beams and acrylic panels in the shape of a globe, this exotic building disorients anyone that sees it. It is, of course, the Montreal Biosphere, built a half-century ago by Buckminster Fuller for Expo 67, the most successful world’s fair of the 20th century. 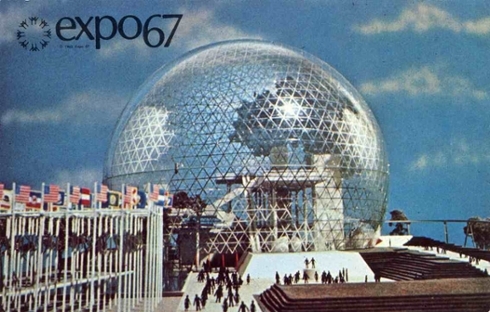 In its time, when so many countries were riven by wars and paranoia, Expo 67 offered the world a brief remove from the painful past and shameful present—it offered what the world most craved: an optimistic vision for the future. My grandfather, who died three years ago, was among the 50 million people who attended Expo 67. The son of a radio repairman in India, he grew up in modest circumstances and struggled to secure himself an education at the only university for Muslims in India. He rose, quickly, to the top of his class, and won a scholarship to come to the US where he began graduate studies in civil engineering at Harvard. Soon after his degree my grandfather returned to what was by then Pakistan, where six of his ten siblings shared two small, adjacent rooms. He worked intensely so he could support and provide a good education to his brothers and sisters. That generation of the Abidi family, though small in number now, all went on to find success in their individual careers, and passed on my grandfather’s tradition of hard work and education to the Abidis of my parents’ generation. My own father, then 11, still clearly remembers the day my grandfather returned home and dazed him with stories about the amazing things he saw at Expo 67. He had brought back with him a Super 8 film he purchased at the fair, which he spooled onto a projector for his family to watch. My father, now an engineer himself, recalls sitting there, rapt, as these futuristic, alien buildings flashed in front of his eyes—the Montreal Biosphere, Habitat 67, the USSR Pavillion.